2011 IPPY Award: Bronze Medalist, ParentingThe Down Syndrome Transition Handbook helps parents prepare their child for independent adult life. It's full of practical tips and step-by-step instructions to help families envision their child's future, develop a transition plan, and implement it. There's also a wealth of information about adults in their twenties or thirties living at home who are still struggling with finding a job, locating housing, or establishing a meaningful life in their community, and who could achieve more independence with the right guidance and supports.The book is the culmination of the author's professional and personal experiences guiding hundreds of families through the transition process, and parenting her own son with Down syndrome, now an adult living independently. 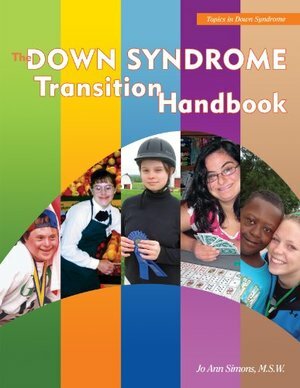 Its conversational style reassures parents overwhelmed by a complex process and its frank advice offers a reality check for parents whose child will soon venture into the adult world, or whose adult child has yet to leave the nest.The Down Syndrome Transition Handbook outlines the steps of transitioning, with an emphasis on the necessity of the child playing an active role in the process. It considers everything families need to know--from meeting broad, basic needs such as finding meaningful ways to fill one's days (work, volunteering, leisure activities, training & education, exercise) and how to get around (driving vs. using public transportation) to addressing specific needs such as whether to leave high school at age 21 or earlier and how to maintain eligibility for benefits by keeping income and assets within allowable limits. Chapters address:High SchoolPostsecondary OptionsTestingResidential OptionsWork & other EndeavorsTransportationHealthFamily & FriendsLegal IssuesFinancial IssuesTechnologyFamilies will want this one-stop resource to demystify the transition process for teens and young adults and to help older adults still at home become more independent.